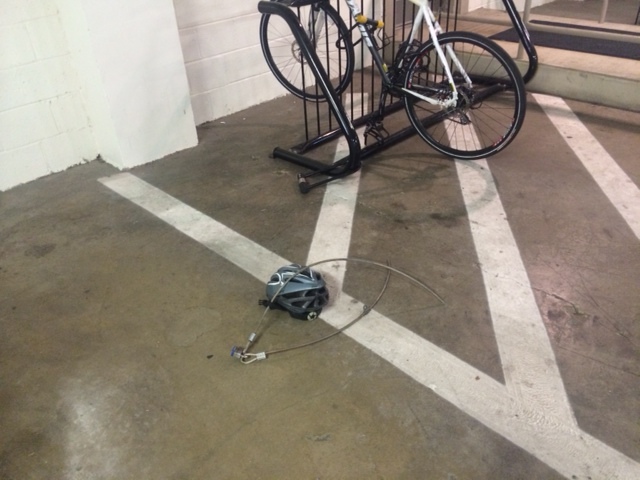 My husband’s bike was stolen from the parking garage at work last week—a bad start to the Labor Day weekend. Bike is his primary mode of transportation but he also rides just for the pleasure of it. As he put it, he’s in mourning for his lost Specialized Tricross, but there is also the feeling of violation when something is stolen, not just misplaced. We spent the weekend searching for a replacement bike. Since he uses it for commuting, he needed to find a new bike as soon as possible. Unlike cars, bicycles don’t usually come equipped with locking devices, lights, horn, fenders or rack. Even the bands that keep pants from getting caught in the chain were swiped. The bike had to be outfitted to make it safe for riding in the dark. Ironically, bike registration stickers from the Arlington police arrived in the mail the same afternoon. Would a sticker have made a difference in the outcome? It’s not something you think about until after the fact. We have paid the price of bike larceny: time and money spent finding a replacement bike, refitting it and reporting to the police. Because we figure the bike was taken in order to sell, we continuing scanning eBay and Craigslist to see if the bike gets listed. The most effective deterrent to bike theft is to make sure your bike is locked, registered and tagged. Learn from our experience and take steps to secure your ride. ← Why is a SEA Circle™ integral to Index Card Cure™?